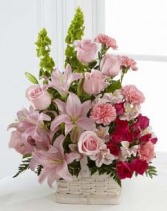 Pink Roses, Asiatic Lilies,peruvian Lilies,fuchsia Carnations, Spray Roses, Bells Of Ireland And Assorted Lush Greens. 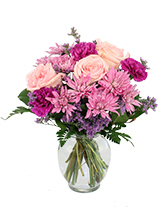 A blushing display of pink roses, Asiatic lilies and Peruvian lilies are highlighted by stems of fuchsia carnations and spray roses as well as Bells of Ireland and assorted lush greens. 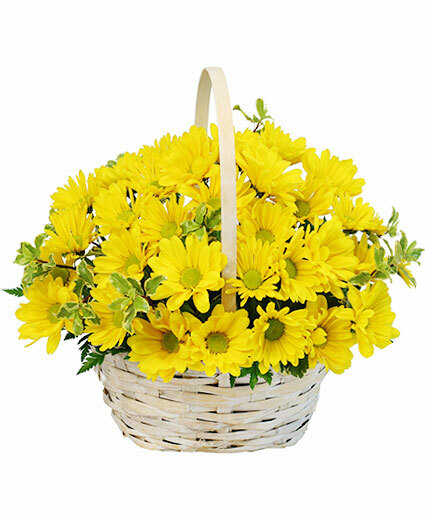 Seated in a white woodchip basket, this graceful arrangement.